After enjoying the previous weeks match at Gold Valley and having another weekend spare I decided to enter another one of their weekly open matches. The match was a big one with 62 competitors taking part. The lakes would be the Bungalow, Syndicate and Gold Lake. I turned up at 8am, the temperature according to the car was a low 2 degrees C. I grabbed some bait from the tackle shop, a pint of casters and some soft hookers. Grabbing a cup of tea I bumped into Barry Parker and his mates, so sat with them to get some more information on the venue. All tips and tricks help, thanks Barry! The first match of 2012 an open match at Gold Valley fished on the Causeway Bank of Gold Lake, Speci and Bungalow Lake. The previous day we had practised on the Bungalow Lake and the lesson learnt for me is "don't forget the silvers" We got to the fishery at 8am, ready for an 8:30am draw. Mark was a little nervous as this would be his first ever match. The field of competitors was quite large including a certain world champion, Will Raison. So we wished each other luck and headed off to our respective lakes. Continuing the Mark vs Mark competition, Mark headed on down to London and we decided to fish Gold Valley on both the Saturday and Sunday. As we are fishing the open match at Gold Valley the Sunday which is across Bungalow and Gold, we decided to fish Bungalow Lake as we hadn't fished that lake before. It would be a good opportunity to practise a couple of methods and to see how the fish would react especially given the very cold weather experienced in the week prior. We asked some advice at the tackle shop and they pointed out the area we should be fishing in. Highlighted on the map of Bungalow lake. Mark selected the peg closest to the corner and I went to his left. The weather for the day was a rather mild 11 degrees C, the wind was gusting from left to right, but our pegs were quite sheltered from the wind. Today marks the first day Anglers who are members of the Angling Trust can apply for Fish O Mania 2012 tickets. It is a random computerised draw which closes on the 7th February 2012 at 1600. After that date the Angling Trust will inform you whether or not you get allocated the tickets you have applied for, so the more the apply for the better your chances. 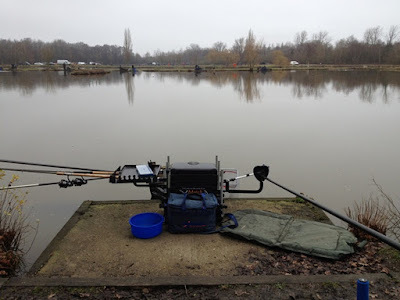 Gold Valley - FailedMessingham Sands - FailedThe Oaks, Sessay - Failed Lindholme Lakes - Successful Entry to each match is £25. Good luck to all the anglers around the country who are applying for tickets and maybe I'll see you on the bank. So this year Mark and I decided to make a weekend of it and try some different venues. Temperature across the weekend was 8-10 degrees C although there was a cold wind blowing. Both Mark and I decided that we would have a two rod approach, my Carp set-up was quickly converted to a Pike dead bait Paternoster rig and I'd recently brought back my Shakespeare Ugly Stik from Australia as my plugging / spinning rod. First stop Mark had decided to re-visit a local river at Elton, Huntingdonshire. We fished the area down from the locke. Both of us put out our dead baits and then "plugged" away the rest of the river. After about 90 minutes and no indications we moved to the main river above the locke which produced nothing for either of us.